Legendary Italian film director, producer and screenwriter Sergio Leone Sadly died on 30 April 1989, of a heart attack at the age of 60. He was born 3 January 1929 and started out In film After watching his father work on film sets, and began his own career in the film industry at the age of 18 after dropping out of law studies at the university.Working in Italian cinematography, he began as an assistant to Vittorio de Sica during the movie Bicycle Thieves in 1948. Leone began writing screenplays during the 1950s, primarily for the ‘sword and sandal’ (a.k.a. ‘peplum’) historical epics, popular at the time. He also worked as an assistant director on several large-scale international productions shot at the Cinecittà Studios in Rome, notably Quo Vadis (1951) and Ben-Hur (1959), financially backed by the American studios.When director Mario Bonnard fell ill during the production of the 1959 Italian epic The Last Days of Pompeii (Gli Ultimi Giorni di Pompei), starring Steve Reeves, Leone was asked to step in and complete the film. As a result, when the time came to make his solo directorial debut with The Colossus of Rhodes (Il Colosso di Rodi, 1961), Leone was well-equipped to produce low-budget films which looked like larger budget Hollywood movies ln the early 1960s, sadly historical epics fell out of favor with audiences. So Leone shifted his attention to a sub-genre which came to be known as the “Spaghetti Western”, owing its origin to the American Western. His film A Fistful of Dollars (Per un Pugno di Dollari, 1964) was based upon Akira Kurosawa’s Edo-era samurai adventure Yojimbo (1961). Leone’s film elicited a legal challenge from the Japanese director, though Kurosawa’s film was in turn probably based on the 1929 Dashiell Hammett novel, Red Harvest. A Fistful of Dollars was also notable for establishing Clint Eastwood as a star. Until that time Eastwood had been an American television actor with few credited film roles.The look of A Fistful of Dollars was established by its Spanish locations, which presented a violent and morally complex vision of theAmerican Old West. The film paid tribute to traditional American western films, but significantly departed from them in storyline, plot, characterization and mood. As a child the American Old West fascinated him , which carried into his adulthood and his films.Leone’s next two films – For a Few Dollars More (1965) and The Good, the Bad and the Ugly (1966) – completed what has come to be known as the Man with No Name trilogy (a.k.a. the Dollars Trilogy), with each film being more financially successful and more technically accomplished than its predecessor. The films featured innovative music scores by Ennio Morricone, who worked closely with Leone in devising the themesSergio Leone’s next film Was Once upon a time in the west, Which was shot mostly in Almería, Spain Cinecittà in Rome & Monument Valley, Utah & starred Charles Bronson, Henry Fonda, Jason Robards and Claudia Cardinale. Once Upon a Time in the West emerged as a long, violent, dreamlike meditation upon the mythology of the American Old West, with many stylistic references to iconic western films. The film’s script was written by Leone and his longtime friend and collaborator Sergio Donati, from a story by Bernardo Bertolucci and Dario Argento, it was a huge hit in Europe, grossing nearly three times its $5 million budget among French audiences, and highly praised amongst North American film students. It has come to be regarded by many as Leone’s best film. Leone’s next film Once upon a time in the West was shot mostly in Almería, Spain Cinecittà in Rome & Monument Valley, Utah & starred Charles Bronson, Henry Fonda, Jason Robards and Claudia Cardinale. Once Upon a Time in the West emerged as a long, violent, dreamlike meditation upon the mythology of the American Old West, with many stylistic references to iconic western films. The film’s script was written by Leone and his longtime friend and collaborator Sergio Donati, from a story by Bernardo Bertolucci and Dario Argento, it was a huge hit in Europe, grossing nearly three times its $5 million budget among French audiences, and highly praised amongst North American film students. It has come to be regarded by many as Leone’s best film. After Once Upon a Time in the West, Leone directed Duck, You Sucker! (Giù la Testa, 1971). Leone was intending merely to produce the film, but due to artistic differences with then-director Peter Bogdanovich, Leone was asked to direct the film instead. Duck, You Sucker! is a Mexican Revolution action drama, starring James Coburn, as an Irish revolutionary and Rod Steiger, as a Mexican bandit who is conned into becoming a revolutionary.Leone continued to produce, and on occasion, step in to reshoot scenes in other films. One of these films was My Name is Nobody(1973) by Tonino Valerii ] a comedy western film that poked fun at the spaghetti western genre. It starred Henry Fonda as an old gunslinger facing a final confrontation after the death of his brother. Terence Hill also starred in the film as the young stranger who helps Fonda leave the dying West with style.Leone’s other productions included A Genius, Two Partners and a Dupe (1975, another western comedy starring Terence Hill); The Cat (Il Gatto; 1977, starring Ugo Tognazzi), and A Dangerous Toy (Il Giocattolo; 1979, starring Nino Manfredi). Leone also produced three comedies by actor/director Carlo Verdone, which were Fun Is Beautiful (Un Sacco Bello, 1980), Bianco, Rosso e Verdone(White, Red and Verdone – Verdone means “strong green” – a pun referring to the three colours of the Italian flag, the star and to director Verdone, 1981) and Troppo Forte (Great!, 1986). During this period, Leone also directed various award-winning TV commercials for European television.In 1978, he was a member of the jury at the 28th Berlin International Film Festival. Leone turned down the opportunity to direct The Godfather, in favor of working on another gangster story he had conceived earlier. He devoted ten years to this project, based on the novel The Hoods by former mobster Harry Grey, which focused on a quartet of New York City Jewish gangsters of the 1920s and 1930s who had been friends since childhood. The four-hour finished film, Once Upon a Time in America (1984), featured Robert De Niro and James Woods. It was a meditation on another aspect of popular American mythology, the role of greed and violence and their uneasy coexistence with the meaning of ethnicity and friendship. Unfortunately Warner Bros. Edited it drastically for the American market, abandoning its flashback structure for a linear narrative. Lasting over just two hours, the recut version received much criticism and flopped. However The original version, was released in the rest of the world, and achieved major critical acclaim, with some critics hailing the film as a masterpiece. International Jazz Day is a yearly event on 30 April, organized by UNESCO to celebrate “the virtues of jazz as an educational tool, and a force for peace, unity, dialogue and enhanced cooperation among people.” The Day was proclaimed during the UNESCO General Conference in November 2011. The first annual International Jazz Day was kicked off in Paris by UNESCO Director-General Irina Bokova and UNESCO Goodwill Ambassador Herbie Hancock. UNESCO partners with the Thelonious Monk Institute of Jazz. American pianist, keyboardist, bandleader, composer and actor Herbert Jeffrey “Herbie” Hancock was born April 12, 1940. He Started his music career with Donald Byrd, he shortly thereafter joined the Miles Davis Quintet where Hancock helped to redefine the role of a jazz rhythm section and was one of the primary architects of the post-bop sound. He was one of the first jazz musicians to embrace synthesizers and funk music. Hancock’s music is often melodic and accessible; he has had many songs “cross over” and achieved success among pop audiences. His music embraces elements of funk and soul while adopting freer stylistic elements from jazz. In his jazz improvisation, he possesses a unique creative blend of jazz, blues, and modern classical music, with harmonic stylings much like the styles of Claude Debussy and Maurice Ravel. Hancock’s best-known compositions include “Cantaloupe Island”, “Watermelon Man” (later performed by dozens of musicians, including bandleader Mongo Santamaría), “Maiden Voyage”, “Chameleon”, and the singles “I Thought It Was You” and “Rockit”. His 2007 tribute album River: The Joni Letters won the 2008 Grammy Award for Album of the Year, only the second jazz album ever to win the award, after Getz/Gilberto in 1965. French painter Édouard Manet Sadly died 30 April 1883 in Paris After contracting rheumatism, syphilis and Locomotor Ataxia a known side-effect of syphilis, which caused him considerable pain and for which his left foot was amputated because of gangrene. HBorn 23 January 1832 at his ancestral hôtel particulier (mansion) on the rue Bonaparte.His father, Auguste Manet, was a French judge who expected Édouard to pursue a career in law. However His uncle, Edmond Fournier, encouraged him to pursue painting and took young Manet to the Louvre.In 1841 he enrolled at secondary school, the Collège Rollin and in 1845, he enrolled in a special course of drawing where he met Antonin Proust, future Minister of Fine Arts and subsequent lifelong friend.in 1848 he sailed on a training vessel to Rio de Janeiro, but twice failed the examination to join the Navy. Instead From 1850 to 1856, Manet studied under the academic painter Thomas Couture. In his spare time, Manet copied the old masters in the Louvre and From 1853 to 1856, visited Germany, Italy, and the Netherlands, and was influenced by the Dutch painter Frans Hals, and the Spanish artists Diego Velázquez and Francisco José de Goya. In 1856, Manet opened a studio Where he painted The Absinthe Drinker (1858–59), beggars, singers, Gypsies, people in cafés, and bullfights. he rarely painted religious, mythological, or historical subjects; apart from Christ Mocked, now in the Art Institute of Chicago, and Christ with Angels, in the Metropolitan Museum of Art, New York. Manet had a portrait of his Mother and Father and The Spanish Singer, displayed at the Salon in 1861. 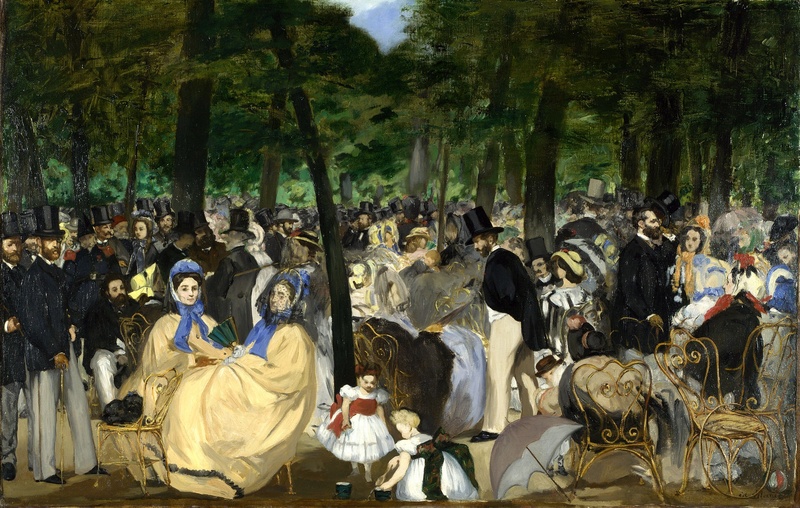 In 1862 he painted Music in the Tuileries, and in 1863 he painted The Luncheon on the Grass (Le déjeuner sur l’herbe) which was exhibited at Salon des Refusés (Salon of the Rejected) and also painted Olympia, both of which caused great controversy. In 1868 he painted Berthe Morisot with a Bouquet of Violets and also became friends with impressionists Berthe Morisot, Edgar Degas, Claude Monet, Pierre-Auguste Renoir, Alfred Sisley, Paul Cézanne and Camille Pissarro, Morisot also became his sister-in-law when she married his brother, Eugene in 1874. Unfortunately Manet was excluded from the International Exhibition of 1867 at the Paris Salon, so he set up his own exhibition. In 1879 he painted a self portrait and became influenced by the Impressionists, especially Monet and Morisot and also painted two portraits of the composer Emanuel Chabrier. Among Manet’s fans were Émile Zola, Stéphane Mallarmé, and Charles Baudelaire. In 1878 he painted The Cafe Concert, which was set in the Cabaret de Reichshoffen on the Boulevard Rochechouart, and went on to paint many other cafe scenes depicting the Bohemian social life in 19th-century Paris in which people were depicted drinking beer, listening to music, flirting, reading, or waiting. Manet also visited Pere Lathuilles a restaurant on the Avenue de Clichy and painted Chez le père Lathuille (At Pere Lathuille’s). In 1873 he painted Le Bon Bock and in 1864 he painted The Races at Longchamps and Masked Ball at the Opera and his 1868 painting The Luncheon was painted in Manet’s Dining Room. Manet also painted War subjects including View of the International Exhibition, and the Battle of the Kearsarge and Alabama (1864), the Battle of Cherbourg (1864) and The Barricade. The French intervention in Mexico also interested him and he Painted The Execution of Emperor Maximilian, 1867, an action which raised concerns regarding French foreign and domestic policy and is currently at the Museum of Fine Arts, Boston. In January 1871, Manet traveled to Oloron-Sainte-Marie in the Pyrenees and his friends added his name to the “Fédération des artistes” of the Paris Commune. In 1973 He painted The Railway, widely known as The Gare Saint-Lazare, and In 1874 painted several boating subjects which are now in the Metropolitan Museum of Art, His last major work, was A Bar at the Folies-Bergère (Un Bar aux Folies-Bergère), and In 1875, he provided Lithographs for a book-length French edition of Edgar Allan Poe’s “The Raven”. Then in 1881,the French government awarded Manet the Légion d’honneur. Sadly Manet contracted syphilis in his forties, for which he received no treatment. He also suffered from rheumatism. In the years before his death, he developed locomotor ataxia, a known side-effect of syphilis, which caused him considerable pain. In April 1883, his left foot was amputated because of gangrene, and he died eleven days later on 30 April 1883 in Paris and is buried in the Passy Cemetery in the city. American composer, pianist, and big-band leader Duke Ellington was Born 29th April in 1899. During his life he wrote over 1,000 compositions. In the opinion of Bob Blumenthal of The Boston Globe “In the century since his birth, there has been no greater composer, American or otherwise, than Ellington.” A major figure in the history of jazz, Ellington’s music stretched into various other genres, including blues, gospel, film scores, popular, and classical. His career spanned more than 50 years and included leading his orchestra, composing an inexhaustible songbook, scoring for movies, composing stage musicals, and world tours. Several of his instrumental works were adapted into songs that became standards. Due to his inventive use of the orchestra, or big band, and thanks to his eloquence and extraordinary charisma, he is generally considered to have elevated the perception of jazz to an art form on a par with other traditional genres of music. His reputation increased after his death and the Pulitzer Prize Board bestowed on him a special posthumous honor in 1999. Ellington called his music “American Music” rather than jazz, and liked to describe those who impressed him as “beyond category.” These included many of the musicians who were members of his orchestra, some of whom are considered among the best in jazz in their own right, but it was Ellington who melded them into one of the most well-known jazz orchestral units in the history of jazz. International Dance Day is celebrated Annually on 29 April. It was introduced in 1982 by the International Dance Council (CID, Conseil International de la Danse), a UNESCO partner NGO. The date is not linked to a particular person or a particular form of dance, although it’s also the day when the French dancer and ballet master Jean-Georges Noverre was born. The main purpose of Dance Day events is to attract the attention of the wider public to the art of dance. Emphasis should be given to addressing a new public, people who do not follow dance events during the course of the year. Every year, the president of the International Dance Council sends the official message for Dance Day which circulate in every country around the world. In 2008, Professor Alkis Raftis, the previous President of the International Dance Council stated that Governments, sponsors, and the media, Governments (national, regional or local), sponsors (private or public) and the media (newspapers, magazines, radio, TV) are the three most important factors affecting the practice of our art and that Dance professionals struggle to approach them individually – with poor results and proposed a better way: through CID Sections representing all forms of dance, all levels, all functions. 2010 was proclaimed as International Year for the Rapprochement of Cultures and designated UNESCO as lead agency in this celebration. Since then The new Director-General of UNESCO Irina Bokova, proposed a universal vision, dubbed “new humanism” – a vision open to the entire human community, providing a humanist response to globalization and crisis, aiming at the safeguarding of social cohesion and the preservation of peace. She stated that dance being a central part of every culture, constituted vthe ideal means for bringing together people from different countries. Festivals also promote in the most lively manner reciprocal knowledge and respect of diversity; there are hundreds of millions attending international dance festivals each year. She also suggested that Teachers in foreign countries provide immediate bridges of understanding ingrained into the bodies of dancers; there are tens of thousands of dance teachers crossing national borders yearly.She walso said that Congresses and open conferences should provide opportunities to showcase one’s work to an audience of peers; there are dozens of international meetings of dance researchers, historians and critics in any given year. She mentioned that festivals, classes or conferences, simply watching on television a dance from a foreign country offers the most striking, appealing and convincing image of another ethnic group and that For vividly illustrating cultural diversity, for embodying rapprochement, there is no better means than dance. In 2014, around 50 classical dancers got together to perform a flashmob at Chennai and performed dance. It is said to be the first flashmob of classical dancers. Prolific British film director and Producer, Alfred Hitchcock KBE, sadly passed away 29 April 1980. He was born 13 August 1899 in Leytonstone, London and during a career spanning more than half a century, Hitchcock directed more than fifty feature films, many of them psychological thrillers. Among his most famous films are Rebecca, North By Northwest, Notorious, The Birds, Psycho, Jamaica Inn, Rear Window, Rope, The Man Who Knew Too Much, Vertigo and Marnie. During his career. Hitchcock also developed many pioneering techniques in the suspense and psychological thriller genres during which he created a distinctive and recognisable directorial style. He pioneered the use of a camera made to move in a way that mimics a person’s gaze, forcing viewers to engage in a form of voyeurism He framed shots to maximise anxiety, fear, or empathy, and used innovative film editing. His stories frequently feature fugitives on the run from the law alongside “icy blonde” female characters. Many of Hitchcock’s films have twist endings and thrilling plots featuring depictions of violence, murder, and crime, although many of the mysteries function as decoys meant only to serve thematic elements in the film and the extremely complex psychological examinations of the characters. Hitchcock’s films also borrow many themes from psychoanalysis and feature strong sexual undertones. Through his cameo appearances in his own films, interviews, film trailers, and the television program Alfred Hitchcock Presents, he became a cultural icon. Alfred Hitchcock has left a long lasting legacy in the form of some fantastic films including Rebecca, Notorious, Saboteur, Spellbound, Psycho, Rope, The Birds, North by Northwest, Marnie, Vertigo, Rear Window, The Man Who Knew Too Much and Frenzy. He also came first in a 2007 poll of film critics in Britain’s Daily Telegraph, which said of him: “Unquestionably the greatest filmmaker to emerge from these islands, Hitchcock did more than any director to shape modern cinema, which would be utterly different without him. His flair was for narrative, cruelly withholding crucial information (from his characters and from us) and engaging the emotions of the audience like no one else.” The magazine MovieMaker also described him as the most influential filmmaker of all time, and he is widely regarded as one of cinema’s most significant artists. Many of his films still remain popular today and are often shown on television. The Austrian-born philosopher Ludwig Wittgenstein, was born 26th April 1889. He worked primarily in logic, the philosophy of mathematics, the philosophy of mind, and the philosophy of language, and was professor in philosophy at the University of Cambridge from 1939 until 1947. During his lifetime he published just one book review, one article, a children’s dictionary, and the 75-page Tractatus Logico-Philosophicus. In 1999 his posthumously published Philosophical Investigations was ranked as the most important book of 20th-century philosophy, standing out as “…the one crossover masterpiece in twentieth-century philosophy, appealing across diverse specializations and philosophical orientations”. He was Born in Vienna into one of Europe’s wealthiest families, he gave away his entire inheritance. Three of his brothers committed suicide, with Ludwig contemplating it too. He left academia several times: serving as an officer on the frontline during World War I, where he was decorated a number of times for his courage; teaching in schools in remote Austrian villages, where he encountered controversy for hitting children when they made mistakes in mathematics; and working during World War II as a hospital porter in London, where he told patients not to take the drugs they were prescribed, and where no-one knew he was one of the world’s most famous philosophers. He described philosophy, however, as “the only work that gives me real satisfaction.” His philosophy is often divided between his early period, exemplified by the Tractatus, and later period, articulated in the Philosophical Investigations. The early Wittgenstein was concerned with the logical relationship between propositions and the world, and believed that by providing an account of the logic underlying this relationship he had solved all philosophical problems. The later Wittgenstein rejected many of the conclusions of the Tractatus, arguing that the meaning of words is constituted by the function they perform within any given language-game. Wittgenstein’s influence has been felt in nearly every field of the humanities and social sciences, yet there are widely diverging interpretations of his thought. In the words of his friend and colleague Georg Henrik von Wright: “He was of the opinion… that his ideas were generally misunderstood and distorted even by those who professed to be his disciples. He doubted he would be better understood in the future. He once said he felt as though he were writing for people who would think in a different way, breathe a different air of life, from that of present-day men.” Wittgenstein sadly passed away on April 29th in 1951 of Prostate Cancer and is buried at the Ascension Parish Burial Ground in Cambridge. However his legacy lives on and In 1999 the Investigations was ranked as the most important book of 20th-century philosophy, standing out as “…the one crossover masterpiece in twentieth-century philosophy, appealing across diverse specializations and philosophical orientations”.